If you are working on a Windows environment you might get some simple questions about what are they ? Here I have listed some simple questions and the answers I found by exploring things by own and referring the Internet. Please make a comment in case if I’m wrong. What is a Computer Name and the Full Computer Name in Windows OS ? A computer name in Windows is just the name of the computer. It is something like you have a name. For example Thuru-PC. 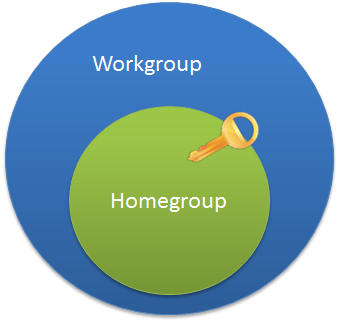 What is the difference between Domain, Workgroup and a Home group ? Computers running Windows on a network must be part of a workgroup or a domain. Computers running Windows on home networks can also be part of a home group, but it’s not required. Computers on home networks are usually part of a workgroup and possibly a home group, and computers on workplace networks are usually part of a domain. Computers on a home network must belong to a workgroup, but they can also belong to a home group. A home group makes it easy to share pictures, music, videos, documents, and printers with other people on a home network. A home group is protected with a password, but you only need to type the password once, when adding your computer to the home group. Home groups aren’t available in Windows Server 2008 R2. One or more computers are servers. Network administrators use servers to control the security and permissions for all computers on the domain. This makes it easy to make changes because the changes are automatically made to all computers. Domain users must provide a password or other credentials each time they access the domain. If you have a user account on the domain, you can log on to any computer on the domain without needing an account on that computer. You probably can make only limited changes to a computer’s settings because network administrators often want to ensure consistency among computers.